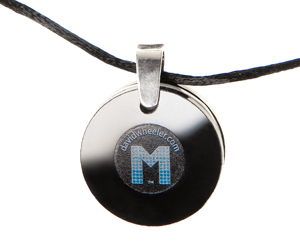 The M Circuit is a pendant worn around the neck or carried in a pocket, purse or handbag and contains a special pattern made out of copper that enhances a fundamental experience of Life Force Energy. Understanding how the M Circuit works comes from understanding the integration of ancient wisdom and modern science, as a spiritual philosophy. In mainstream physics the creative power of the universe could be defined as Zero Point Energy, which is the type of energy that is accumulated and expressed by the M Circuit and is responsible for opening and integrating all the channels and centers in the body. The life energy field of the body becomes stronger and more adaptable to stimulus and change.